Let’s say you’ve taken your two daughters to a Taylor Swift concert and your seats are in the infamous ‘nosebleed’ section, and it seems the stage is a mile away. The seats still cost you a small fortune, but your girls are loving the show anyway as the concert goes to intermission. After a few minutes in the darkness suddenly the fans in your section start cheering and you turn around to see a spotlight guiding Taylor herself walking down the stairs just a few feet away, as she takes her guitar and begins performing! Just like that the worst seats in the house have become front row, and what was already a great concert for your little girls, just became a night they will remember for the rest of their lives. Because Taylor Swift just created something amazing for the people that love her. I was reading about this yesterday in a great post by Jennifer Blanchard over at ProBlogger’s place on how Taylor goes out of her way to connect with her fans. During her Fearless tour, Taylor was known to leave the stage during intermission, only to reappear at the back of the arena, where she began playing for fans in those seats farthest from the stage. Another way that Taylor creates something special for her biggest fans that come to her concerts is with the T-Party. The T-Party is a place where Taylor and her band like to crash before the concert, where they can hangout, play video games, etc somewhere in the arena. But during the concert, Taylor’s family and helpers will be scanning the crowd looking for the fans with the most ‘spirit’. The ones that are the most excited, the ones with the crazy outfits, or sometimes it will be the quiet girl that came by herself. They pick a couple dozen of these fans, and invite them back to the T-Party after the concert! Then Taylor and her band come back to the T-Party and hang out with the fans for a few hours, signing autographs, playing video games with them, and just hanging out. These instances perfectly illustrate how Rockstars don’t have fans because they are Rockstars, they have fans because of how they treat their fans. Taylor doesn’t have to go out of her way to play for the fans in the nosebleed section, but she does. She doesn’t have to go to the extra time and expense of setting up the T-Party events for just a couple dozen fans after the concert, but she does. Because she loves her fans. And her fans know that, and they love her right back. We marketers make this brand advocacy stuff a lot harder than it needs to be. 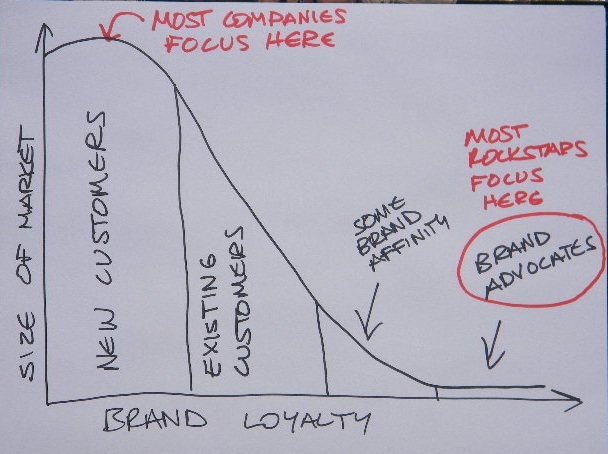 Most companies want new customers, most Rockstars want to connect with their biggest fans. 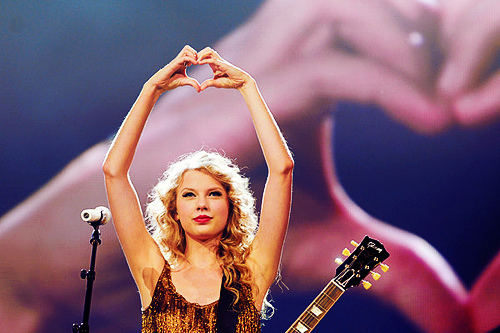 By having a T-Party, Taylor touched the lives of those 24 fans. And then they will go home and tell their friends, and tweet about it and Facebook it, and just go crazy. Taylor understands what most Rockstars do, that she’ll get new customers tomorrow because she delighted her existing fans today. And that will happen after every concert, watch the above video and note what happens at the 1:46 mark. When the woman is explaining to the group what’s going to happen, as soon as she says ‘T-Party’, the girls in the front row immediately grab each other cause they knew exactly what the T-Party was! Year after year, Taylor is looking for ways to connect with and delight her biggest fans. Even if it’s only 24 at a time. Her approach has helped make her beloved by millions and one of the most famous people on the planet. How’s your company’s approach working? Focusing on your best customers works well after you’ve done all the hard work to acquire new customers. Thus its no surprise she gets ACM Entertainer of the Year (fan voted) for two years running. I’ve forgotten this advice myself. Humbly I admit to not focusing on those around me when I had a solid St. Louis brand. Heck, being labeled Mayor does sound great. Problem is forgetting to focus on the ones that respect and care about you the most. Continuing to give them a bit of me; I’m both cheap and easy; why not.